HandBrake can let you know when a newer version is available, and even automatically download and install available updates. Before updating, please make sure there are no pending encodes in the Queue. If you are currently using HandBrake older than version 1.0.0, also make note of any custom Presets you have created, as they may not be compatible with newer versions. 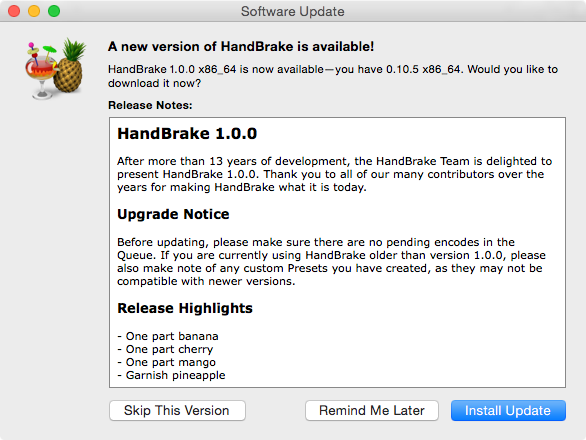 The Linux version of HandBrake does not have a built-in update checking feature. Your Linux distribution’s package manager will handle any updates to the official PPA. After you’ve installed and launched HandBrake more than once, it will ask whether you want to automatically check for updates. Select Check Automatically and HandBrake will offer to install future updates as they become available. Checking for updates automatically can help you stay up to date with the latest features and bug fixes. Automatic update checking may be enabled or disabled in HandBrake’s preferences. Using the main menu at the top of your screen, select HandBrake and then Preferences.... You will find the option in the General section. Manually checking for updates is easy. Using the main menu at the top of your screen, select HandBrake and then Check for Updates.... If an update is available, HandBrake will offer to install it for you. If an update is available, HandBrake will offer to install it for you. Automatic update checking may be enabled or disabled in HandBrake’s preferences. From the Tools menu select Preferences. You will find the option in the General section. HandBrake will alert you when a new update is available. Manually checking for updates is easy. From the Help menu, select Check for Updates.... If an update is available, HandBrake will offer to install it for you. Continue to Opening a video source.